Recently I was asked if I would review TalkTalk phone, TV and broadband packages and I instantly agreed. We are so much an internet household, but because of this we never watch live TV, in fact we have never had a Sky subscription, and have not even got a working TV aerial, we very rarely buy newspapers and a huge chunk of my friends have been made through the virtual world. 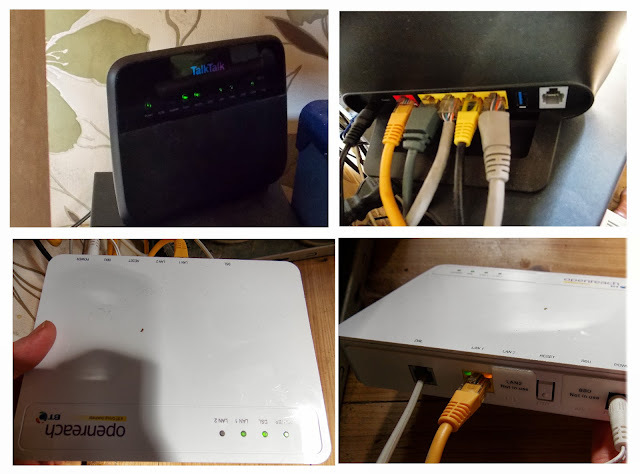 As an existing TalkTalk customer I already knew the broadband service was good, we had been experiencing good reliable connection for years, however the TV side of things had always passed me by and I was interested to see how TalkTalks TV extras worked. I was contacted by the staff at TalkTalk who tested my internet connection - and advised me that upgrading to Fibre Optic would improve the TV experiences. We were sent out the new routers ( you need 2 control boxes for Fibre Optic to work) in the post and then waited for the friendly engineer who arrived in the time slot specified to install the new Fibre Optic Internet service. Installing the Fibre Optic broadband was simple a change of socket and the two new boxes and we were up and working. TalkTalk offers HomeSafe service, which includes lots of options to provide safer internet access for the whole family, and free local phone calls. With 3 computer systems, an xbox and a laptop, which on occasions are all being used at the same time, it is great to have the super fast speed - uploading videos to youtube takes just seconds and downloads are even quicker! The service has been problem free and the whole process has been a great experience. But what of the TV? TalkTalk TV package includes a YouView set top box, which enables you to pause record and rewind all the freeview live TV shows which you get access too via a standard TV aerial. Also the YouView box give you a chance to have extra TV boost packages added to your subscription on a month by month basis increasing your options on channels you wish to receive. As I mentioned earlier, we didn't initially actually have a TV aerial, but the YouView box also connects upto your internet and streams TV through your broadband connection so a TV aerial is not essential to enjoy some of the most popular TV channels. An engineer arrived with the YouView box a few days after our Fibre Optic broadband went live, and he was hugely professional and very friendly, we talked about the fact that we didn't have a TV aerial as yet to use and he offered to help connect up an aerial, or set up a stand alone aerial if we had one (however we didn't take him up on this) he talked us through the YouView box options and explained how the TV boosts all worked via the internet connection so we decided, for us, the aerial connection wasn't essential at this point. He showed us how to navigate the channels using the remote control supplied, and left us with a useful user guide for further reading. What really makes The YouView box from Talk Talk special however is the TalkTalk Player feature which is exclusive to TalkTalk customers, and provideds a great choice of additional channels available as add on boosts, all streamed via the internet which means you do not need a TV aerial or a Satellite dish to access some of the top programmes. However there are OnDemand sections for most of the Sky channels which means you can pick out your favourite shows to watch as and when you require. Each boost is on a paid month by month basis, you can add boost depending on your needs. To access the additional channels you have to view the TalkTalk player section, the menus are all accessed easily via the remote control although sometimes they do take a little longer to load. Once in the TalkTalk Player you can see a full list of additional channels and select through the various boosts, you can add channels to your monthly subscription directly via your remote control - you will need a 4 digit pin. It is worth keeping this private so the children don't add additional channels without your agreement. The choice of additional channels is huge with options to add on all the families favourites on a month by month contract. Sky Movies for example is £15 a month and gives you access to the 11 top movie channels including Sky Movies Premier, Sky Movies Disney and Sky Movies Family. The Kids TV boost is just £5 a month and includes all the childrens favourites. We have a 3 month free trial of the Entertainment Boost - which includes the Kids boost. 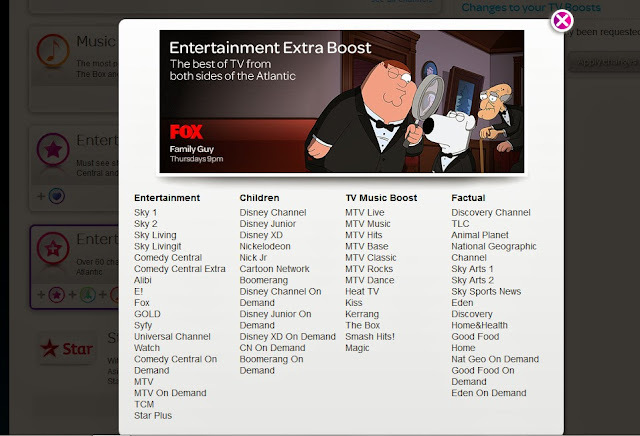 The entertainment boost is normally £15 a month and includes over 60 of the best channels. There is a huge variety of programs to choose from, something to suit all ages. With firm favourites such as Peppa Pig, Dora the Explorer and Mickey Mouse Club house for the younger viewers to Victorious, iCarly and Sam and Cat for the older children. My daughter was especially thrilled to have access to Nickelodeon enabling her to watch Victorious and iCarly on demand. She now can finally watch the programs so many of her friends talk about at school. I will be doing several more posts over the coming months showing other features to the TalkTalk TV phone and broadband packages. or follow TalkTalk on Facebook and Twitter. 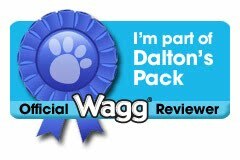 We have received free Phone, Broadband and TV for 18 months for the purpose of this review - all views and opinions are however my own. Hi Sarah, you can add and remove Boosts in the online MyAccount as well... no need to wait in a phone queue to remove a Boost. WHAT A LODE OF SHITE. T.V WOULD NOT WORK HERE. I RETURNED BOX AND EXTENTION MODEM. NEVER WATCHED A SINGLE PROGRAM AND THEY BILL ME £90. HIGHWAY ROBBERS, DO NOT TOUCH THEM. Never go for talktalk. Yes its cheap but always disconnecting and too slow. And once you upgrade and if you want to cancel later because of slow speed or disconnection, they will not cancel it even you phone them to cancel it under the time period. I have canceled my contract because too many problems and they ask me to pay over £500 pounds because of 24 months contract and I paid but still they are keep sending me the bills and they are keep saying this will be the final amount. I am screwed. Watch what customers says on youtube videos and you will know what I mean.